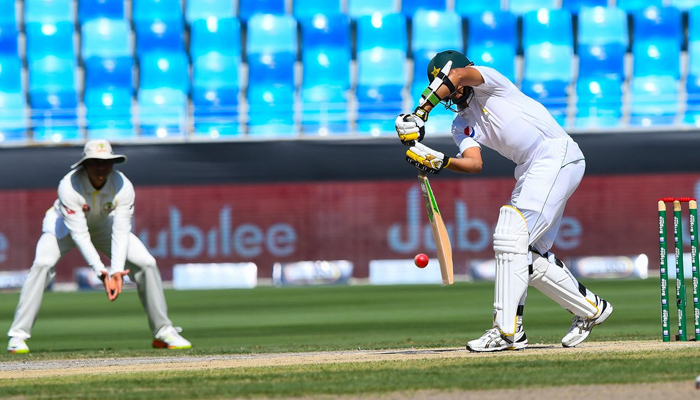 DUBAI: Pakistan’s batsmen continued to prosper on a flat pitch to reach 329-4 at lunch on the second day of the first Test against Australia in Dubai on Monday. Haris Sohail was unbeaten on 46 and with him Asad Shafiq on 43 not out as Pakistan added 74 runs for the loss of just one wicket after resuming at 255-3. Sohail and Shafiq ensured Pakistan built on a solid foundation laid by opener Mohammad Hafeez who made 126 on the opening day. The opening wicket produced 205 runs with Imam-ul-Haq who scored 76. Pakistan lost nightwatchman Mohammad Abbas in the fifth over of the day, bowled by fast bowler Peter Siddle for one in the fifth over of the day. Siddle was the pick of the bowlers with 2-28. Shafiq hit a four and a six off spinner Nathan Lyon while Sohail smashed one off left-armer Jon Holland over long-on to add 69 runs for the unbroken fifth wicket stand. Neither Lyon nor Holland have yet to trouble the batsmen on an unresponsive Dubai stadium pitch, which is expected to take turn from day three.